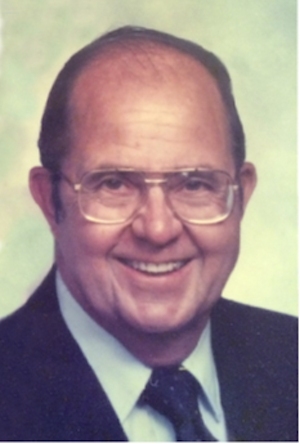 Obituary – Clark, Harley Leon « Perry High School Alumni Association, Inc.
Harley Leon Clark, died at age 93 this past Monday morning 27 July at his home following extended illness. If you have ever made a hotel or airline reservation, or observed a well-executed multi-level organization succession plan, your life has been touched by his pioneering work during his 35-year career with IBM. Harley was married to Virginia Lee Magee known to all as “Ginny,” who died in September 2011 at the age of 88. Both were long-time residents of Hendersonville, North Carolina, after retiring and moving from New Canaan, Connecticut. Ginny and Harley were high school sweethearts that married during WWII. Harley was a Regimental Sargent Major in General Patton’s Regimental Service Company and received a Purple Heart before his honorable discharge in 1945. He was the son of Sheridan Anthony Clark and Elsie Combs Clark from his hometown of Perry, Oklahoma. Harley and his sister Sybil spent early formative years during grade school living and calling home a converted railroad boxcar as an apartment provided the Santa Fe Railroad. His father, known as SA, was a track foreman for Santa Fe and building a second rail line between Chicago and Dallas. The one-room school houses that changed almost every other month as the track progressed allowed Harley to hear the lessons of all grades at once – and helped him skip two elementary school grades. During his career with IBM Harley was part of the team that created the SABRE reservation system for American Airlines in Tulsa, Oklahoma – the first of its kind – and later was branch manager for the team that created HOLIDEX for Holiday Inn in Memphis, Tennessee, the first electronic hotel reservation system. These were the early system models for electronic transaction processing; the fundamental principles are still in use today. He dedicated over a decade late career being part of the team that created the Executive Resources Program for IBM, essentially the company’s internal executive recruiting and placement function. As Director of Executive Resources for the Data Processing Division (DPD) and later the National Accounts Division, he led early identification of talent that included women, minorities, veterans, the disabled, amongst other categories considered for intentional talent cultivation. Several generation of IBM chairmen were identified by this program before Harley’s retirement, and the fact that the current global leader is female is a testament to the early work this program did to identify and nurture world-class talent and have remarkable people lead IBM from all walks of life. Many large enterprise organizations have studied and adopted IBM’s Executive Resources program as a model for multi-level succession planning and executive talent identification. Harley’s IBM career took the family across the U.S.: Tulsa, Oklahoma; Kansas City, Missouri (home: Leawood, Kansas); Memphis, Tennessee; Chicago, Illinois (home: Deerfield, Illinois); White Plains, NY (home: New Canaan, Connecticut). His family is celebrating, not mourning, a great father, faithful husband, professional pioneer and a superb friend. Harley is survived by his son, Kevin Clark and his wife, Heidi Sawyer-Clark of Chapel Hill, North Carolina; his daughter, Pamela Clark, and granddaughter, Taylor Parker, both of Hendersonville, North Carolina. In lieu of flowers, the family requests donations be made to the First United Methodist Church of Hendersonville in Harley’s honor. Both Ginny and Harley have been actively involved in the Hendersonville Methodist church for over 30 years, and both were members of Methodist Church choirs in many communities over the past 70 years. Services will be held on Thursday, August 6 at 11 a.m. at the First United Methodist Church of Hendersonville, with the Rev. Mark Ralls officiating. The family will receive visitors in the Christian Life Center following the memorial service, a building, along with the columbarium and memory garden, Harley helped create.